TOKYO – Asian shares firmed on Tuesday as recently volatile crude oil prices showed some stability, though gains were limited by caution ahead of a widely anticipated US interest rate increase by the Federal Reserve. China’s yuan, meanwhile, weakened against the dollar after the People’s Bank of China (PBOC) set its official midpoint rate CNY=SAEC at its lowest level in more than four years for a second day. MSCI’s broadest index of Asia-Pacific shares outside Japan .MIAPJ0000PUS extended early gains and added 0.5 percent. 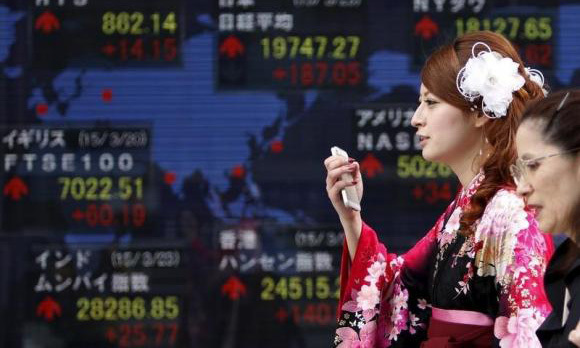 But Japan’s Nikkei stock index .N225 slipped about 0.3 percent ahead of the expected U.S. rate increase. On Wall Street, major indexes erased early losses and marked gains as oil prices found their legs. S&P 500 e-mini futures ESc1 were up 0.3 percent in Asian trade. U.S. crude oil CLc1 edged up 0.1 percent to $36.37 after falling as low as $34.53 on Monday before rebounding to end nearly 2 percent higher. Brent crude LCOc1 inched slightly higher to $37.94 after falling as low as $36.33 a barrel on Monday, its weakest since December 2008. A fall below $36.20 would take oil down to levels not seen since 2004. Besides the direction of oil prices, the outlook for Fed monetary policy loomed large in the markets’ collective consciousness. Investors have mostly priced in a rate hike this week, with the main question now hinging on how many increases will follow next year. Traders see an 83 percent chance the Fed will lift its targeted rate range from 0.25 percent to 0.50 percent at the two-day policy-setting meeting ending on Wednesday, from the current zero to 0.25 percent range, according to CME Group’s FedWatch program. “Most investors would normally look to buy a currency ahead of a rate hike but in the case of the Fed, their well-telegraphed decision could mean more losses for the greenback,” Kathy Lien, managing director of FX strategy for BK Asset Management, wrote in a note to clients. “Everyone who wants to be long dollars ahead of the rate decision is probably long already with more traders moving to the sidelines as the big day nears,” she said. In Asian trade, the dollar edged down about 0.1 percent against a basket of currencies to 97.504 =USD .DXY. It was nearly flat against the Japanese currency at 121.02 yen JPY=, while the euro was slightly higher at $1.1011 EUR=. The Australian dollar AUD=D4 added about 0.5 percent to$0.7279, bolstered by relatively upbeat minutes from the Reserve Bank of Australia’s December policy review, which said recent positive economic trends suggested a steady interest rate outlook in the near term.